This crossover style ring is Rose Gold Overlay Sterling Silver. The band separates into five branches each with an oval shaped natural turquoise gem at the end. The turquoise is mined in Arizona. 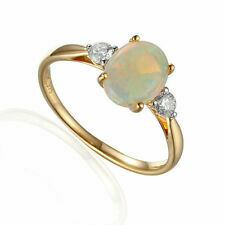 I have this ring in size M (US 6)The ring will be delivered in a small pouch. Please see my other items for more gorgeous Jewellery and accessories. Beautiful 925 solid Sterling Silver (stamped). White Sapphire Halo ring. Art Deco inspired. Size P and a half. Uk handmade. New, will come in a velvet drawstring presentation pouch. Russian Apatite Sterling Silver Cocktail Ring. 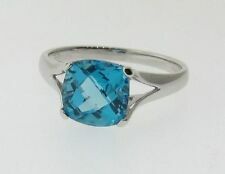 This is an elegant sterling silver cocktail ring with large round high quality genuine apatite stones. Each stone is individually set and there are 3 stones in total. 1.10cts This ring is part of a large collection so please look at my other listings. Condition is new with the tag and has never been worn. Sterling silver ring with two smoky quartz faceted stones, each in the shape of a ball. An interesting twist design with natural stones set into a simple silver twist surround. Most unusual. The ring is marked 925 for sterling silver. This exquisite, handmade, stamped 925 sterling silver ring weighs 6.4 g. The ring is 2.1 cm in length along the finger at the front and the band has a wide of 0.6 cm. GORGEOUS LABRADORITE GEMSTONE STAMPED 925 STERLING SILVER RING UK SIZE O, US SIZE 7.25 - weighs 6.4 g - (My code R62) - Code 1. Natural Side Blue/Purple Tanzanite. 50cts. Natural Center Yellow Sapphire.96cts. Natural Side Round White Diamonds. 04cts. Ring Size: 4.5. Can This Ring Be Sized: (YES). Color: Yellow Clarity: Clean. 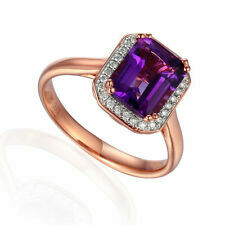 Beautiful Genuine Colour Change Flourite Sterling Silver Cocktail Ring. This is a beautiful sterling silver cocktail ring with large oval cut high quality light blue flourite stones. Each stone is individually set and there are 5 stones in total. Note the detailing around the settings, this again adds to the desirability of this ring. ATGW 4.25cts This ring is part of a large collection so please look at my other listings. Condition is new with the tag and has never been worn. Natural Side Round Cut White Diamonds.15cts. Ring Size: 8.25. Can This Ring Be Sized: (YES). Gram Weight: 2.19 Grams. Natural and Genuine Blue Sapphire and White Zircon Sterling Silver Cocktail Ring. This is a beautiful sterling silver cocktail ring with three large pear shape high quality blue sapphires and two small zircons on the shoulders of the ring. Each stone is individually set and there are 5 stones in total. ATGW 1.70 cts This ring is part of a large collection so please look at my other listings. Condition is new with the tag and has never been worn. This exquisite, handmade ring was made from stamped 925 sterling silver and weighs 4.8 g. They are set into a stamped 925 sterling silver ring and the ring is 3 cm in length along the finger. GORGEOUS LABRADORITE GEMSTONE STAMPED 925 STERLING SILVER RING UK N, US 6.75 - weighs 4.8 g - (My code R60) - Code 1. 925 silver triple cut rainbow moonstone rings; Multiple Sizes. Gift bag. Natural Center Purpleish/Blue Tanzanite.65cts. Natural Side Round Cut White Diamonds.08cts. Ring Size: 5.25. Can This Ring Be Sized: (YES). Color: Purpleish/Blue Clarity: Clean. Natural Center Purpleish/Blue "AAA" Tanzanite: 2.27cts. Natural Side Round Cut White Diamonds.31cts. Natural Side Baguette Cut White Diamonds.41cts. Ring Size: 5.25. Can This Ring Be Sized: (YES). Free Ring Sizing. Item can be re-sized at no cost to you. Natural Center Oval Cut Blue Sapphire: 1.67cts. Natural Side Round Cut White Diamonds.13cts. Ring Size: 9.25. Can This Ring Be Sized: (YES). Color: Blue Clarity: Clean. Gram Weight: 2.16 Grams. Natural Center Purpleish/Blue "AAA" Tanzanite: 3.04cts. Natural Side Round Cut White Diamonds.45cts. Ring Size: 6. Can This Ring Be Sized: (YES). Color: Purpleish/Blue Clarity: Clean. Gram Weight: 3.46 Grams. Natural Center Cushion Cut Peach Morganite: 2.53cts. Natural Side Round Cut White Diamonds.20cts. Ring Size: 6.25. Can This Ring Be Sized: (YES). Color: Peach Clarity: Clean. Gram Weight: 3.20 Grams. Band width 2.5 mm. UK size S ½- ¾. The stones are a VERY light green, almost colourless. Handmade in India with 925 quality silver. Natural Oval Cut Red Ruby.47cts. Natural Round Cut White Diamonds.08cts. Ring Size: 7.25. Can This Ring Be Sized: (YES). "Pure 92.5% Solid Sterling Silver Indian Handcrafted Jewelry". RING SIZE - H TO Z AVAILABLE. Natural Side Round Cut White Diamonds.18cts. Color: Green Clarity: Clean. Ring Size: 5.5. Can This Ring Be Sized: (YES). Gram Weight: 5.48 Grams. Natural Center Purplish Blue Chalcedony: 7.90cts. Natural Side Red Ruby.40cts Color: Red. Can This Ring Be Sized: (NO). Ring Size: 7.25. Color: Purplish Blue Clarity: Clean. Natural Side Mother of Pearl : 2.90cts. Natural Side Round White Diamonds. 10cts. Ring Size: 7. Can This Ring Be Sized: (YES). Total # Of Stones: 1 Cut: Checkerboard Oval (RingMM: 15.31mm). Total # Of Stones: 12 Cut: Round. STONE - Natural Blue Labradorite Gemstone. "Pure 92.5% Solid Sterling Silver Indian Handcrafted Jewelry". RING SIZE - H TO Z AVAILABLE. I am downsizing my jewellery collection. International Ring Size Chart. 6 1/2 0.668 M-½ 52 3/4 17 13 12 3/4. 5 1/4 0.627 K 49 5/8 16 --- 9 5/8. Size M ~ 6 1/4. 13 0.882 --- 69 22 27 29. 8 0.717 Q 56 1/2 18 16 16 1/2. 9 0.750 S 59 19 18 19. 5 3/4 0.643 L 50 7/8 --- 11 10 7/8. Set in 14k gold over sterling silver. Features 32 beautiful natural Tanzanites for a 2.5 cts gem weight. This is a fantastic looking ring at a great price. A double panel white glass background with silver overlay encrusted with a kaleidoscope of gemstones. UK Size Q US Size 8. weight 6.53 grams. Here I have a large stone Natural Larimar bought from Gems TV as it was then its now Gemporia. Designed by Giuseppe 'Pippo' Perez. Giuseppe Perez is a top Naples born Italian jewellery designer. Total gem weight 3.00 cts. Set in 14k Gold overlay Sterling Silver. Next to the designers stamp there is a Kanchanaburi Blue Sapphire. Ring Size – UK: R / US: 8 & ¾ - could be re-sized by your jeweller. I look forward to hearing from you. For info see: gem-a. This exquisite, handmade ring was made from stamped 925 sterling silver and weighs 6 g. The golden rutilated quartz gemstone is 1.9 cm x 1.6 cm in size. 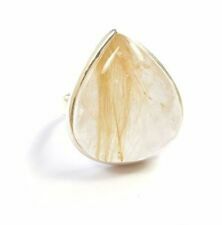 GORGEOUS GOLDEN RUTILATED QUARTZ GEMSTONE STAMPED 925 STERLING SILVER RING UK SIZE M, US SIZE 6.25 - weighs 6 g - Code 1. Band width 5.5 mm. UK size O ½-¾. Handmade in India with 925 quality silver. Beautiful 9ct Gold Kyanite & Diamond Ring. International Ring Size Chart. Size N ~ 6 3/4. 12 0.849 Y 66 1/2 21 1/4 25 26 1/2. 11 3/4 0.841 X 65 7/8 --- --- 25 7/8. 11 1/2 0.833 W-½ 65 1/4 21 24 25 1/4. 925 Sterling Silver Clear CZ Large Cocktail Cluster Ring. Weight - 5g. This item is 925 Sterling Silver and the gemstones we describe them as. Face (Top To Bottom) - 2.5cm. 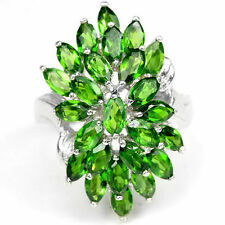 Tsavorite Garnet cocktail ring, containing 45 Tsavorite Garnet gemstones weighing 0.75 carats, all round in shape and 30 that are 1.5 mm round and 15 that are 1.25 mm round. Weighing 0.57 carats and 0.18 carats respectively.